2G Products are specialists in the manufacture of metal name plates for machine identification, test plates, ratings plates, offshore container plates and for brand identification incorporating both text and corporate logos. Over the years, 2G Products ability to manufacture anything from one off prototypes to production quantities has attracted a diverse customer base, with our products being used across various industries including medical, military, transport, energy and many other environments. Finding durable quality metal name plates can often be challenging, with some inferior products which can let you down. Metal name plates produced by 2G Products are engineered to last, unlike others on the market which are simply a screen printed image onto the metal name plate, which will wear off in time. Our metal name plates are of industrial quality and produced using our US-020A Anodised Aluminium, the print is then beneath the anodised surface. Other metals that are used for name plates include brass and titanium. 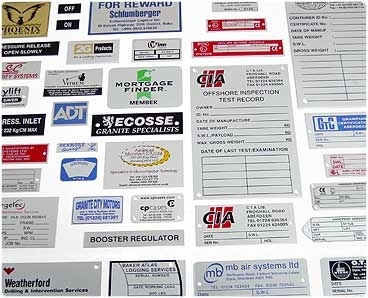 2G Products also make name plates in plastics as well as decals and stickers for identification and marking. US-020A anodised aluminium print quality is of such high quality that you can have text as small as 1mm high on your name plates which is perfectly legible.